The Page 99 Test: Nancy Segal's "Born Together—Reared Apart"
Nancy Segal is the author of Someone Else’s Twin: The True Story of Babies Switched at Birth, Indivisible by Two: Lives of Extraordinary Twins, and Entwined Lives: Twins and What They Tell Us About Human Behavior, and the senior editor of Uniting Psychology and Biology: Integrative Perspectives on Human Development. Page 99 opens with a discussion of personality similarity in twins reared apart. One of the most exciting and provocative findings from the Minnesota Study of Twins Reared Apart was that identical twins reared apart are as similar in personality as identical twins reared together. This means that family resemblance in personality traits is due to shared genes, not shared environments! The unique experiences we have apart from our family members also affect our personality development. I was very privileged to have spent my first post-doctoral years associated with the Minnesota study of Twins Reared Apart, directed by University of Minnesota professor Thomas J. Bouchard, Jr. Meeting the twins and observing their behaviors over the course of a week was a thrilling experience. And watching their relationships with one another evolve was also exciting. Most of the twins were adoptees and were so gratified to finally meet a biological family member, especially a twin. Born Together—Reared Apart documents the origins, methods, findings, implications and controversies of Minnesota study. The book includes marvelous pictures of some of the twins we studied, as well as the amazing life history events responsible for their separation and eventual reunion. The reared apart twin design provides one of the best approaches to studying genetic and environmental influence on behaviors involves the rare pairs of identical and fraternal twins reared apart and reunited. The size of the correlation between reared apart identical co-twins offer scientists a pure estimate of genetic influence on behavioral and physical traits. The size of the correlation between reared apart fraternal co-twins provides an informative comparison. Greater resemblance between identical than fraternal twins is consistent with genetic influence on the traits under study. The Minnesota study began in 1979 and continued for twenty years. The volume of material that accumulated was too vast to include in a single volume. I have, therefore, included some supplementary material in a web site: drnancysegaltwins.org. Information about my other books can also be found there. It is amazing that twins continue to be separated today, given the increased appreciation for family ties. In the past, twins were separated mostly due to illegitimacy or maternal death. Today, the new assisted reproductive technologies that may yield several babies, not just one, have caused some families to relinquish one or more of their multiple birth children; these families may lack the resources to properly care for them. China’s One-Child Policy was also indirectly responsible for the separation of pairs of mostly female twins. In fact, I am studying those twins, as well. And new cases occasionally cross my desk from unexpected sources. These cases are all scientifically informative in their own way, but bringing the twins together is the most satisfying part of the process. 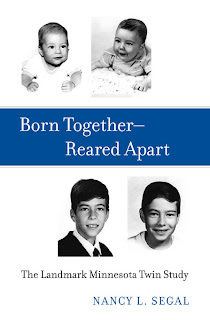 Learn more about Born Together—Reared Apart at the Harvard University Press website.